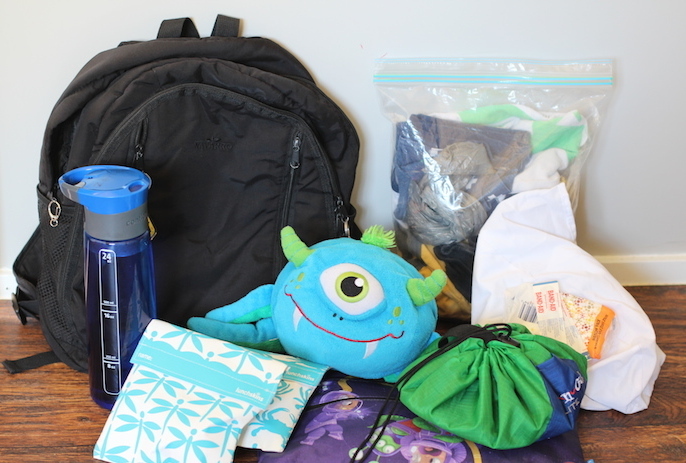 In this post I will share the must-have items I pack into my kids’ travel bags, whether it’s for the car or for a plane. My boys are now ages 4 and 7, but the contents were mostly the same when they were toddlers as well. I always pack a few more snacks than I estimate the kids will actually eat in case we have an unexpected delay. Depending how long the trip is, I also bring a full meal in case the kids don’t care for restaurant food if we need to pull over or don’t like the airline food if we are flying. Peanut butter or jam sandwiches, chips/crackers and a fruit that doesn’t go brown like grapes or strawberries are the usuals. 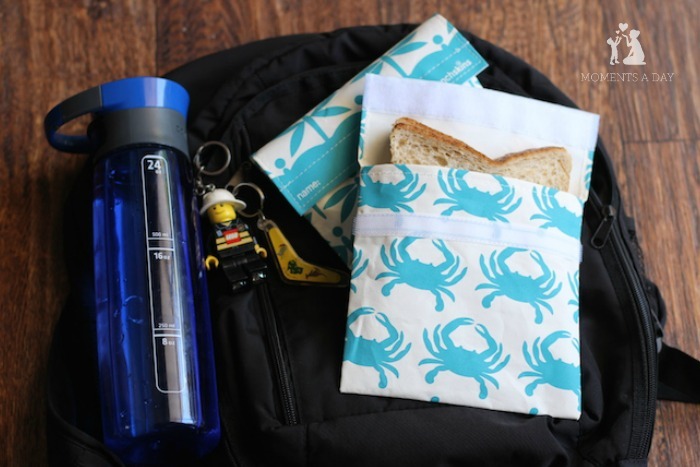 Reusable food bags are a great way to bring food without bulky containers, plus then you can use them to carry snacks when you are at your destination. They are easy to wash, lightweight and take up hardly any space to store – perfect! Water bottle — just be sure to tip out any liquid before going through airport security! A few small toys. 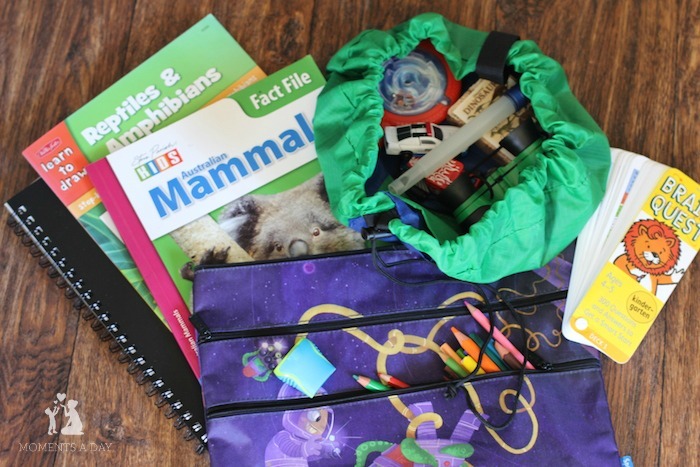 Lay n Go activity mats (which turn into drawstring bags) are perfect to keep bits and pieces. There are even a couple pockets within the bag to keep tiny toys like LEGO. The mat also eliminates the need to dump out all your toys at once, which is the first step to keeping things from getting lost! I tell the kids they can take as many toys as fits into this bag, which is a good size as well. Keep in mind it’s easier to find and use things when a bag is not stuffed to the max. I used to go overboard on the “entertainment” items but now I know that less is more… I try to bring a few things that will be used and appreciated instead of packing everything just in case. Favourite sleeping stuffed animal which can double as a pillow if needed. On flights, my kids like to use travel pillows. I like the blow-up kind because they take up less space and weight when not being used! Extra pair of clothing in case of an accident. Even older kids might spill a drink in a moving vehicle, and it’s nice to have an outfit ready instead of digging through the luggage. Don’t forget socks and a jacket if you are flying because the air-conditioning is usually cold for kids! 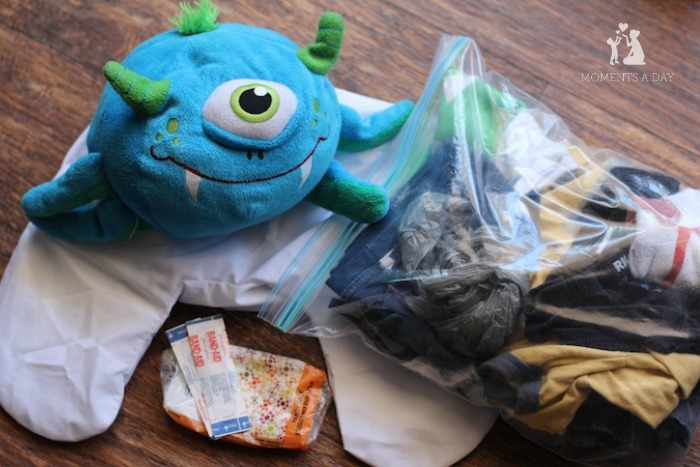 I like to keep extra outfits a large zip lock bag so the items stay together plus it’s easier for kids to take out and put back when they are looking for something else in their bag. I also stick in an empty plastic bag in for storing anything that gets messy/wet. Airlines usually provide blankets on long haul flights but if you are traveling at night on the road, kids may appreciate a blanket. All of the above fits into a child-sized back pack. I think it’s important to keep a child’s bag light especially if you want them to carry it on their own. In my bag I usually keep a few extras items in case they are needed. What else do you pack in a kids travel bag? 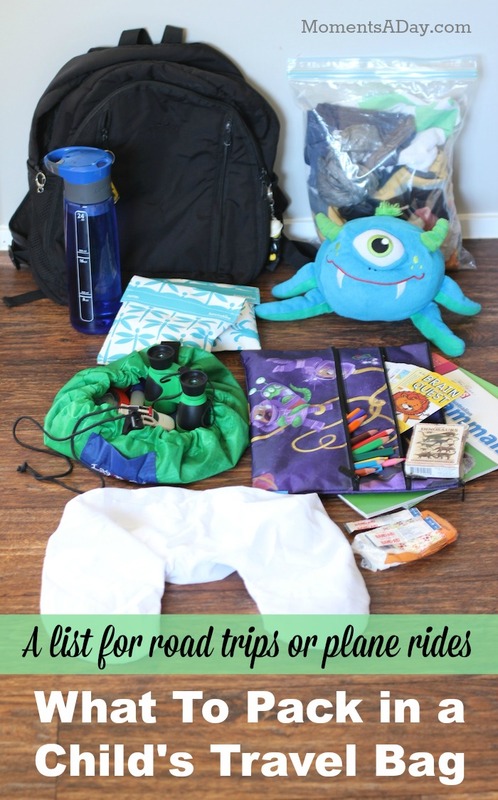 Any other awesome tips for traveling with kids? Please share! A great selection of travel games and travel gear can be found at Finlee and Me. 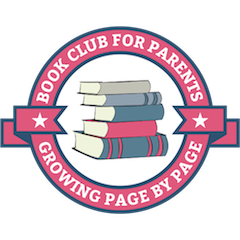 You can follow Finlee and Me on Facebook and Instagram to be notified of new products, sales, and giveaways. This post is sponsored by Finlee and Me. All opinions are my own. To read more about sponsorship on my website, visit this page. Yes it’s hard to convince the kids that you don’t need certain things 😉 I find you need way less entertainment on long haul flights since they have the mini TVs/game stations. For medium flights i.e. 3 hours is when you need a few things to keep the kids occupied! Hope you all have a great trip! !